Addiction Services for York Region is getting to the heart of the problem with the launch of a new travelling clinic that will hit many of our community’s hotspots. Addiction Services (ASYR) staff and representatives of the Central LHIN (Local Health Integration Network) launched M-RAAM, the new Mobile Rapid Access Addiction Medication clinic at their Aurora office on Monday morning with a mission to provide drop-in services for people looking for help with their substance abuse, gambling or tobacco use. This view is also expressed by the Central LHIN, which serves as the primary funder for ASYR. 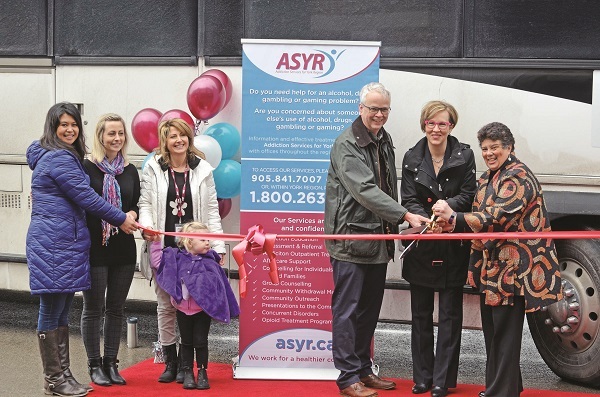 ASYR is the largest addiction service provider within the Central LHIN. Based in Aurora, they offer a number of clinics and offices throughout York Region and are set to open up a new office next month in Alliston to serve the residents of South Simcoe. The M-RAAM clinic looks like an ordinary coach bus from the outside, but it is another story all together as soon as you climb the steps inside. There, those seeking out its services will find a comfortable atmosphere in which to speak to on-board nurse practitioners, case managers and counsellors. At the moment, M-RAAM is a pilot project and its future growth will be determined by both funding and demand. Following Monday’s launch, the bus was headed immediately to its first few stops in Sutton and Pefferlaw, followed by stops in Woodbridge and Newmarket later this week. A full itinerary will be posted each week on their website at asyr.ca. First-timers will be asked to go online and fill out a brief form and ASYR will call the applicant back and set up a time to come and visit.